Joyetech Cubox is an ultra-compact box mod with easy one button design. It has a built-in 3000mAh battery and a fan-shaped top display for battery indication. 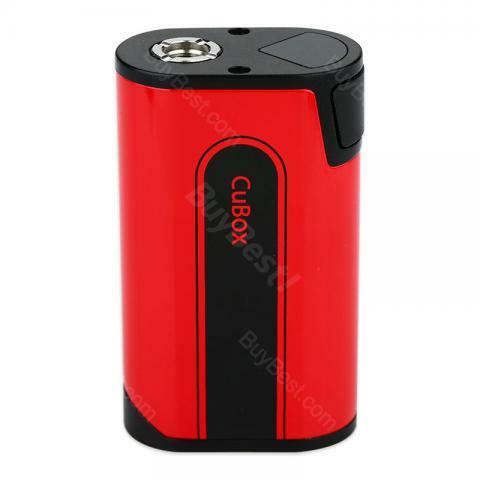 The Cubox mod supports max 50W output power and 2A fast USB charging. The dual protection circuit system ensures a safer vaping for daily using. Joyetech Cubox is a compact yet powerful box mod with built-in 3000mAh battery. The Cubox mod features a fan-shaped top LED display for battery indicator, 2A fast USB charging (with optional RC adaptor) and exquisite 510 stainless steel connector. It supports max 50W output power, which will provide enough power for daily using. Moreover, dual circuit protection will make the Cubox mod more reliable during vaping. Available in six colors, you can grab one and make your vaping colorful. • We suggest you use it with CUBIS 2 Atomizer. Joyetech ist sehr schön. Die Liquids sind gut gemischt, so dass man verschiedene Geschmacksrichtungen gleich ausprobieren kann. the best price and product every, thank you!